I don't know about ya'll - but Sundays can be one of the most stressful days of the week around here. Sundays should be a day of rest and a day to go to God's House and worship Him but sometimes getting there can be a mess. We were racing this morning to get all 3 of us ready and things were going wrong all around. I managed to snap a couple of pics of Harper but didn't have time to really get good ones because we were late but I knew her outfit would be a mess by the time we got home (and it was). Right after I snapped these - she spit up all over her new outfit and I didn't have time to change her. FUN! (I got this little outfit and another one at Dillard's yesterday - they had some PRECIOUS outfits for about 70% off and I just couldn't resist). Anyway - we rush to church and we are super late and have to park way off and we drop Harper off in the nursery. I went to check on her between church and Sunday School and of course she was screaming. I got her settled down but after Sunday School when we went to get her she was mad as a hornet. She calmed down in the car so we tried to go out to eat but before they could even take our order she was screaming so loud the entire restaurant was staring at us. I was so embarrassed. So we left frazzled and came home to eat peanut butter for lunch. ha! And honestly - I've spent the good part of this afternoon wondering why we have the one child who acts so awful at church. All the other babies are so calm and content and I want so badly to be a good mom and to have a sweet child. And she IS. She is beautiful and precious and I am so blessed I can't stand it. But she just acts so awful out in public. I know the key is to just keep going and to keep trying and eventually she will understand that Church is a wonderful place to go and she will grow to love it. (I should add that the nursery workers are WONDERFUL, loving people and it has nothing to do with them or anything in there - she just has separation anxiety. She's used to being with me 24/7 and I'm rarely ever away from her. I know she will grow out of it. She's pretty happy 90% of the time these days. She just wants her momma). (But that can be hard on a momma). But in the midst of all my stress today - I managed to hear a sermon on obedience and a Sunday School lesson on doing God's will and I'm so glad because I'm struggling in those areas right now also. I'm going out of town tomorrow for two days and meeting my parents who are going to help me with Harper and I'm going to be speaking to two different groups and sharing our story. And I'm a nervous wreck. I DON'T speak. (In fact - I've turned down several requests to speak because I just CAN'T do it). But I agreed to this and I'm just sick about it. I know it must be something God wants me to do because I don't want to do it AT ALL! ha! So I'm praying He gives me the words to say. I know that what I have to say has nothing to do with me anyway but how God has worked in me and through me. Have you ever stepped out of your comfort zone to do something that you knew God was calling you to do but that you felt you just couldn't do??? I've been there many times and God has always blessed me. I taught preschool Sunday School for several years and I was so nervous and felt so non equipped. But God blessed me so much through that. Do you struggle knowing God's will for you or for your life? I would love to hear your thoughts or stories! Do you remember what Moses said? He couldn't do public speaking either! God uses only your lips...He will do the speaking through you if you give it to Him. Speak about what a great and loving God He has been for you! We have seen Him this year, haven't we, move in mightly ways?? Tell others about it!! That is your task! You will do great! If all else fails, show Harper! She is God's miracle in the flesh! I sure do understand what you are talking about with public speaking. But your story and your passion in telling it will relieve all of your stress! God will be standing right there beside you the whole time! I love Dillards, but the closest one to us is 150 miles away...boo hoo. Harper's dress is sooo cute, too! Now I want to go shopping! My daughter and grand-daughter just left after a week long visit and I miss her already! I will post pics later on my blog! Have a blessed day, Kelly! Hi Kelly! I know your day you had to day all to well!! But trust me she will love it and she will get used to it!! But as a Momma i know all to well how stressful getting out the door may be! HaHa I was just saying to my hubby today on the way to church this morning How are we going to get 3 kids ready for church if we have trouble getting out the door with the 2 we already have?! He just smiled and said it will be fine! But to get back to your ? About stepping out of our comfort zones to do what God calls you to do! Well that was me last year! I felt the Lord was calling me to step up and be the co-coordinator of our MOPS group at our church! At 1st i pushed it aside and then I kept feeling that all to familiar feeling that God was then Tugging on m heart to step up! Well I did and it was such an amazing re-warding experience, One of my dearest friends Liz and I lead to gether but she wanted to be more of the silent end so that meant me running alot of the meetings and teaching lessons and stuff! Wow that was so hard for me, but through it God has blessed me so much! I have so many great friends and grew sooo close to him! It also helped me in a ton of other area's in my life, like organization in our home being better prepared to leave the house and forced me to be so much more diligent in my personal time with him.....It was such a great experience I was so sad to step down this year! but my oldest is going off to Pre-K on Thursday and she will be going 1/2 days 5 days here in our public school, and our 3rd baby due on Christmas Eve, after so much prayer and late nights talking with jayson it was best we decided I take the year off and but I'm still on the Steering team and very much looking forward to how the Lord leads me this year !! SOrry to get so long winded .. haha i tend to do that!! Hope you enjoyed it! That's such a cute rocking chair! She's almost the perfect size for it! I was just going to mention Moses and your mom beat me to it. God's glory shines brightest through people who "can't". You are a great storyteller on your blog. People will really enjoy listening to you. God just called us to work at the youth department in our church. I feel scared and very intimidated, but we know it's what we are supposed to do. It's exciting to follow His will though. He has better plans than us. You will do great this week! The only reason I can think of why Harper doesn't enjoy nursery is because it is the only time in the whole week she is with out you. You don't get babysitters (except family) and you don't leave her at people houses so you can run errands. She is just not used to having you gone...so when you are gone...she freaks. PS - if you know anyone that's looking for a great new Blog Design, send them my way! I would love to work with some of your followers!! That is an adorable outfit! Her chair is so cute too! I will keep you in my prayers this week. I know what it feels like to be terrified to speak and to feel that the only reason that you are doing it is because He is calling you to. I gave my testimony to my MOPS group last year and I am so happy that I did, it turned into a huge blessing for me in so many ways! God doesn't call us to do things that we can't do. He is stretching you, growing you, and He will be right there guiding your every word. ps... Sundays are a little like that here too. My little guy cried for months, but one day he loved it and has been great ever since! You are not alone with Harper hating the Church nursery! My son is 2 and STILL cries every Sunday at Church! I want him to like Church so much, and i am afraid he will never like going! But I think the reason he does it is because, like you, I stay home with him and he is hardly ever away from me, especially with strangers. He has gotten better though, so there is still hope that Harper will do the same as time goes on! I just want to encourage you. I am currently in the "trenches" with an almost 16 mo little girl. She is my 3rd daughter and all three have different personalities. It sounds like my Kate and Harper have a lot of similarities. I cannot leave Kate in the nursery or anywhere actually. She was overstimulated so easy with lights and sounds and people. We still do not go out to dinner, and have just recently starting going to lunch occasionally. Kate would cry at everyone including her big sis. She has finally outgrown this. Yeah! My last baby was so easygoing and I had no issues like I had this time. That's when you realize it's not your parenting, but just their personality. I felt the same way when I was around other babies -- why can't mine be like that? I was so embarrassed sometimes......... Kate would cry at my next door neighbor everytime she would see her....ugh This has been a very hard and trying time with my little one. God's will for me. I never really knew. I think I have an idea now. Two years ago my youngest daughter started high school and I thought I am going back to school to finish up my nursing. My hubby will be retiring soon and I can have a career finally. One month later I found myself pregnant 11 years after being diagnosed with blocked tubes. I was 42 and my hubby 60. My oldest daughter is 25 with two kids herself. This was a complete shock for my family, but the best unexpected blessing I have ever received. I guess I was just meant to be a mommy and that's just fine with me. Blessings! Your Mom said it perfectly!! That was what our sermon at Church was about today! I was going to tell you the same thing!! Kelly...YOU and your story is exactly what they are asking to hear. Just speak from your heart like you do on your blog. When we do something that comes easy for us, we tend to just use our energy and not HIS to accomplish it! I hope speaking doesn't "chaw" you. You will do great sharing your story! I will be praying for you. You will do wonderful speaking...'cause the neat thing is, is that God uses people...even when we feel like the most unlikely source...to share His love and Grace. God did a work in my life about 2 years before I met Ric in the matter of my dating life and purity....never could I have imagined that I would start speaking to girls all over about Purity and God's plan for their dating life. I was, and am the least of these...and for me to be able to share my story was scary but exciting...I am not a good speaker...not eloquent...have a southern accent(a thick one)...so me speaking seemed crazy. But the crazy thing is, is that God promises His Word will never return void...so I speak....for Him. God wants to use your story to bless others...to share His light...His Grace..His Mercy...and I just know you will do it in a way that honors Him. I will be praying for you Kelly!! You are going to do great things for HIM!! You are not alone. I often wish I had more faith and strength to walk in obedience with the Lord. I listened to a great sermon this morning (b/c I had surgery last week and could not get to church today) about having courage and walking in faith with our GREAT God! It was so encouraging and very challenging for me and current circumstances in my life. It is the one entitled "God is Strong. Am I?" Worth the time it would take to listen. I pray that the Lord uses you in mighty ways for HIS glory this week! You will be in my prayers this week. But I already know that you will do a great job speaking and sharing your story. You are an amazing person and a wonderful mommy. Just remember this when your nervous get the best of you and everything will be okay. Oh I just HEART the pictures of Harper in your post today. They are so cute! Great job Kelly! Have a FUN week! I have followed your blog for several months, but have never commented until now. I just want to thank you for your faithfulness to God and serving him with all your gifts. It is very difficult at times I know. My husband and I were called to work at a Children's Home in our town about 3yrs ago. God paved the way for us, my husband quit a high-paying job, I am an RN and found a job where I worked from home. We both knew/know in our hearts that this is where God called us to serve him. But, it has been hard. Sometimes so hard, that I have wanted to leave. I have many times been on my knees, begging God to take us somewhere else. But, he hasn't and then he comforts me with his words and I am reassured that this is where we need to be. Sometimes, we have to step out of that boat, but all the time knowing that Jesus is holding out his hand. I hope you have a wonderfully blessed week and know that God will be holding his hand out to you when you speak. You are doing a wonderful job as a mother and wife, keep it up!! Don't worry, my daughter hated the nursery too. They get over it eventually. My son currently doesn't love it. But we don't do both services. Good luck! The otfit is absolutely adorable and I'm loving that chair. I completely understand! It is so difficult on Sunday mornings getting everyone ready and out the door on time. My little country church doesn't have a nursery. My little girl was an awesome baby. She never cried or made a peep in church. When she got mobile and started talking, it was a different story. She was something else. There were many times that I wanted to stay home with her. I just thought she was too loud and keeping others from learning. My parents told me to keep bringing her, eventually she would learn to be quiet and listen. It has gotten a lot better. She still likes to chatter. She is not a quiet whisperer. She loves the Lord and He loves her. You will do great with your talks this week. God is using you and making you stronger and wiser. Tell those stories just like you told us. Let those young and old know that no matter how difficult, God expects us to keep on keeping on. He will reward us for determination. God bless you and God bless Harper. I can relate to your frustration. My husband has to work most Sundays, so I am the one that is responsible for making sure that our children are at church on Sunday. Our church does not have nursery during our Sacrament Services so I am there by myself with a 22 month old and a 4 1/2 year old. There are some Sundays that I spend so much time in the hallways with a fussy child that I wonder why I am there. It is because of obedience that I am there most times. I know that God wants me to be there to be an example to my children that being at church is important. If I to what is easiest, they will never know of the things that our Heavenly Father wants them to know. Stick with it. It does get easier and you will fully enjoy and "get something" out of church again. You will also be blessed for your obedience in wanting to raise Harper to love the Lord. Kelly, this was a wonderful post. I have said for years that the devil is alive and well on Sunday morning. It is amazing that five days a week you can get out the door EARLY with everything together and then on Sunday you can't make it to a 9:45 Sunday School on time! You just have to keep pushing past the devil. Aaron cries on Sunday mornings and it always seems like it would be easier to stay home and let him rest and I always say "Devil, you are not going to get me to skip church." I just go anyway and every week it has gotten better. In fact, he is loving nursery now. It's still hard to get there, but we persevere. As far as the other, Robert and I discussed that a lot this week. God has asked me to do something that I really don't want to do and I had to do it in faith. It is always hard and always worth it. I'll be thinking of you as you speak. When I was in college and trying to decided "what to do when I grew up" I kept coming back to medical school. But I had this hang up...I want to be married and have a family. I still do...a really deep desire! I kept wondering how I could do that AND go to medical school and be a doctor? Finally, I just gave up...I said, "Okay, God. You want me to go to medical school..I will." After that, I had the biggest sense of peace that I have felt and I still do. There are so many things that confirm that this is SO what I need to be doing. I love my job (I'm training in pediatrics) and looks forward to it MOST days! I still want to be married and have a family, yearn for it even some days, but I have confidence that God will provide in His time. I thought about you this morning when Annabeth wore some new monogrammed bloomers for the first time. Jackson went through a season of being awful in the nursery when he was this age. It was terribly hard, especially since so much of our life revolved around church. All I can say is, I cried out to the Lord and He heard my cry. Suddenly it stopped and I have no explanation for it. I will pray for you - I know this is wearing on you after 7 months. As wonderful as it is, Motherhood is HARD. Kelly, My daughter Delanie was the same as Harper! She was and still is the loudest one in the nursery and was a bear to take out! It is a tough age because they want down.....we went to many restaurants and left stressed out! Harper is also at the separation anxiety stage too, like you, I too stay home and Delanie really struggled with this! But, let me tell you it will get better! Delanie is almost 2 and does great in restaurants....and even does great in the nursery at church! Our best bet was to be consistent! Good luck and I will be praying for you as you speak....you can do all things through HIM who gives you strength! She is the cutest little girl ever! Love the pictures! I won't necessarily feel this way about church this week, but I'll tell you what I was thinking this week! We have a 7-month-old daughter and a 22-month-old son, and I honestly cannot remember the last time one of us has sat through an entire church service--probably more than 22 months ago. This morning, I missed all of worship getting my son set up in the nursery (we are in a new church because we just moved) while my husband went to sing. I then passed the pager off to my husband while I went into the mothers' room to feed my daughter and attempt to get her to fall asleep in the sling (naptime!). I took 3/4 of the service to accomplish all of that (although I did get to hear the sermon from that room at least). My husband was called down to the nursery to comfort our son about 10 minutes into the sermon and he was able to return to the service. I got to feeling really frustrated and feeling like there is no point to going to church if that is how things are going to go, but the pastor spoke a lot today about knowing that wherever you are in life today is exactly where God placed you to be, and he even mentioned the moms and dads who spend entire sermons walking fussy babies instead of sitting in church. That just took a huge weight off of my shoulders. I had been feeling guilty for not sitting in church, where I "should" be. Instead, our pastor's little comment made me realize that rocking my fussy baby and listening to the sermon as much as possible is where I should be. Sorry for the novel. I just wanted to let you know that you are not alone in struggling on Sunday mornings! Don't feel badly Kelly because Harper's twin in TN does the same thing in the nursery! We usually keep her with us and she does better but it's harder for us to focus especially since she spit carrots up all over me! Keep going, keep trying - eventually they will get it. Can't wait to see how she does at MOPS. Evie does better there. Not sure why! My son was the same way in public. As he got a little older, we discovered that he got overstimulated in public places. It was just too much for him. Now he is 2 1/2 and he still has his mooments, but for the most part it is easier! Harper is a doll!!! Sorry--make that "my husband was NEVER able to return to the service"!!! I will be praying for you as you speak....I feel your anxiety! Your post really convicted me. We have a new baby that will be 10 weeks tomorrow and have really been slacking on church since she was born. At first we stayed home because she was so new, but after that six week point we could have gone back, but have just been lazy. Thank you for being so honest with your post. If you can get up, get ready, and still bring sweet Harper to church (even though you know she will cry in the nursery) surely I can bring my baby (who doesn't even realize I'm leaving her yet)! Thank you for your honesty! Harper is so cute, she will settle down and enjoy being out. I will be praying for you, I just know that you will be terrific. I have found a deeper relationship with The Lord in your blog has helped with that, you are so inspirational. Please let us know how it went. 2 Corinthians 12:9 in the Amplified version. I'll pray it for you this week. then i went on a retreat and with LOTS of prayers i decided to stay and just change the workplace....it's been one of the best decisions EVER!! i met one of my best friends in the new work place and looking back this year has teached me so much....i can't really describe it!! oh i know how you feel! sometimes God's calling on our lives is so hard to grasp or even want to do! I've learned that our greatest callings are usually our greatest fears because the enemy is going to do what he can to keep us from touching people's lives & we just have to bear through it all. when i was 19 i was asked to lead worship at a girl's camp (3 total for the summer, over 300 girls at each) and i was TERRIFIED! i always just sang back up but never ever lead worship. but i prayed & knew that it was what God wanted me to do. and in my obedience God moved in ways I never imagined... He always does when we are obedient. I just have to remember that obedience is always better than sacrifice. I'm getting to that point as God gave me the vision to do a young woman's conference at our church. I just wanted to plan it & run it but now it's looking as if I will also be speaking... ahhh... but I need to be obedient. Thanks for encouraging all of us in this area! I often wonder how in this mess I call a life, in the middle of so many storms, how I could ever even FIND his will. Then I realize... no matter how hard I look or try... HIS WILL finds me. So I should give up on my plans... which I am learning to do even when it is heart breaking. I do often wonder how what WE want and what HE wants can be so VERY different. It will get better. We were lucky that Aaron liked the nursery from the day he came to live with us. he is now going in to church which is another story. He is good most of the time but we are working on the prayer. He always seems to talk really loud during silent prayer. I'm sure everyone looks our direction! He also has a habit of being very unruley at Wal-Mart. Two weeks ago he called other customers "poopie head"'s. We were so supset. He sat in timeout at home. He is beginning to improve and I am learning to be patient. Good luck with your talks. Sundays are hard mornings around here too. My five year old was a crier in the nursery and it was so hard but she and I both made it through. I work in my church nursery and I want you to know that we never think badly of babies who have a hard time away from their mommies and we certainly never think badly of their mommies. Sometimes those are the babies we grow the closest too because they are the ones who need us the most. Take heart, it will get better. I will be praying for your speaking engagement tomorrow, I know that you will be wonderful and that God will be glorified through your story! Well, I'll be praying alongside of you for peace during your speaking engagement. I will also being doing something new on Wed & Thurs and I'm terrified! I will be conducting neonatal resuscitation simulations where I work... basically I will be teaching my peers (nurses and doctors) how to work as a team during infant codes. I haven't been certified in teaching very long, and this is my first official project... you are right... God must want me to do it because I don't want to! Harper is beautiful... Sundays willg get better... sounds like a bit of separation anxiety... means she LOVES HER MAMMA! My little boy will be 2 and he still doesn't enjoy church. He just has major seperation anxiety since I SAH with him. There have been periods that it has gotten better and I bet Harper will too. I have faith that these babies will all learn to love going to church. Will be praying! One night I went way out of my comfort zone and played the piano/sang at church because my grandfather (Poppy) was filling in and preaching for my dad and had asked me to. That was the night that Kurt visited our church for the first time and saw me. We were married 11 months later! God always has unexpected blessings in store! Kelly, I just have to tell you, that that is one of the cutest pictures I've seen of Harper YET! Too cute for words! Neither of my kids let me leave them in nursery, or anywhere for that matter. I have no advice.. I'm a sucker and just took my kiddos to Sunday School with me and they sat in the back on the floor and played. Good Luck. I was never big on public speaking, but now I don't mind so much. As long as you think of the audience as your close friends, you'll be fine. Talk as if you're having a conversation with them. Take a deep breath and have fun!! You'll do great. My mentor has always told me, "If we are in FEAR we are not in FAITH.". God will ALWAYS give you the courage, the means and the gifts to do HIS work and whenever we doubt that for a moment we forget that ALL we do is for His glory and His honor. You have a gift that is touching the "blogging" world in SO many ways :) God has prepared you all along to touch all those hearts that are going to hear you speak and SEE HIM :) Will say a prayer for you. By the way LOVE that dress on Harper, may have to totally copy you and find one for my little girl! 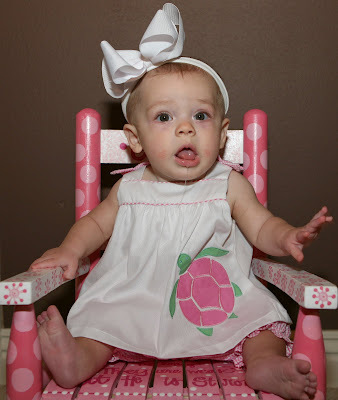 There's just nothing sweeter than a precious little girl in a pretty rocking chair! "God doesn't call the equipped, He equips those He calls!" I know you'll be an absolute blessing to those who hear you speak. And for the record, there are so many things I get sick over from anxiety that it would take a whole blog post to list them. Ha! Also, my girls used to scream any time they were away from me too. They would not even let anyone else hold them, ever! It DOES get better, I promise! We used to never go out to eat because they always had to be held and we could never enjoy our meal. My hubby always tells me not to "sweat the small stuff." Harper being cranky in the nursery is no big deal. They all do it at some point or another. Will she sit with you in the sanctuary? I have 3 boys and well. . . just call me stingy, but I'm not ready to share my 6 month old yet. My older two go to Sunday school (my husband teaches). I sit in the sanctuary with the baby and he loves it. Sundays have always been so stressful for me. I think Satan is just working overtime on Sundays to get us distracted from what they day is really supposed to be! Kelly Kelly....where oh where is her adorable rocking chair from? Reading your post reminded me of the first time i spoke at a Sun night service. My pastor called me at home to see how i was doing the night before. I was so scared. I told him i was praying for the rapture to come that night! It didn't, i spoke and it ended up being great!. I think it is normal to get nervous and question what you have to say or why you. But you do have a story - God the Father want to tell HIS story through you. It is a story of hope and love. It will help mark the trail for others to travel in following Him. Just sharing your heart will share the heart of the Father. Regarding church - crazy as this sounds, just start talking to Harper about how peaceful she is at church. "happy Harper is going to be happy and peaceful today". My pastor just told the story of how they spoke over their baby Peaceful Paul - and he was not so at the time, but has he grew - that is what he grew into. You know - "calling forth the blessings of God"!!! My son was exactly the same way as a baby. He grew out of it around seven or eight months of age and is now a great little boy ( he is 4). Lots of moms have been in your shoes...hang in there! That sweet baby will mellow out eventually! You will do so well speaking, Kelly. Breathe, relax, rest in His peace and will and maybe don't even think about it (if you can :)) until you are there! With church- we too are taking a rest from services at the moment. Family time is too precious with hubby gone 5 days a week and certainly we've been commanded to have a day of rest! SO. We make sure we see friends/ have times of prayer/ family worship/ bible reading etc etc all through the week. Also reading lots of books full of great teaching, etc is so helpful when missing out on services. I truly think God wants us to have a quiet spirit, to rest on this day and that can be impossible when are little ones are little. :) Just my thoughts!! I have found that I have an easier time getting my kids to school at 7:45 than I do getting them to Sunday school at 9:45. I think it's because I dress them up, and I take a little more time on myself. I have been so busy I forgot it was church potluck this morning and found myself sending hubby to Walmart early! I made chicken spaghetti before church! Whew! And my littlest boy had choc cereal on his face when we walked in the doors! :) I will say a prayer for you. It is so hard to step out of your comfort zone. I was asked to do something at my church and wanted to say no, but could feel the burden on my heart, so I decided to pray about it. Having three kids, being pregnant, and building a house seemed to come first...but I realized that God's work comes first. I am SO nervous about it! Oh, and I love Harper's dress! Don't worry Kelly - my first was a screamer in public, and my fourth... the other two in between were sweet little babies! She may sence your uneasyness about being in public?! Dunno but you are right keep trying it will happen ... I know that the nursery at daycare is mostly because she is NOT used to it ... that is the only time you leave her and she is scared ... that will pass too! Good luck speaking I will say some prayers for you ... you will do fine so my prayers will be for you to feel the love and compassion surrounding you! Both of my children also spit up ALL THE TIME as babies...one thing I did that helped ALOT was to constantly keep bibs on them. It was so much easier to take the soiled bib off and put on a new, clean one than to change their whole outfit! Keep clean ones in her diaper bag when you're out and about (like at church). You should give it a try - I think you'll find it works! Another idea is to make Saturdays the day to take Harpers pictures instead of Sundays, and it will be one less thing you have to stress over on Sunday mornings! Also, try laying out clothes the night before and packing as much as you can in Harper's diaper bag the night before as well. The more you can have done, the better and less stressful Sunday mornings will be. That way you can enjoy the Lord's Day! Also, Harper will eventually get used to being left in the nursery and it WILL get better! Just give it time. It is a stage!! In fact, she may come out of the stage and be okay at church and then out of the blue, go through the stage again. But in the end, she will one day love to go to church! My two year old and four year old both look forward to it all week! Moses did it and so can you! I'll be lifting you up to Him! I sure do understand what you are talking about here. I have stepped out of my comfort zone before. The Lord will help you through. I will pray for you about the speaking engagement. As far as having an 'awful' child; she's not awful in public. She is the type probably that certain change of scenery out of her normal home over-stimulates her and she can't talk so she hollers. That's normal and you have to keep working on it. Don't be hard on yourself as a parent. I have one we are still working with on changes. Oh another thing I just thought of; it could be separation anxiety, too. My daughter used to be the terror in nursey. She screamed from the minute we hit the nursery hall until we would get home after church. It was awful. We plugged through and suddenly one Sunday I picked her up and they reported that she had PLAYED!!! Each Sunday since has gitten better and better and now she goes into nursery willingly and has fun. Patience, Mama. She will get there. I understand the frustration. Truly. Praying for your speaking engagements. Just be yourself: look how many of us just love that about you!! What a cute rocking chair! Where did you get it? The dress is adorable, and of course the bow is too! God's calling you out and you'll do a great job. Just be yourself and he'll take care of the rest. This is a story you know better than anyone. Don't try to be anyone but Kelly. Man am I excited for you. Praying for you to have peace but also that the Holy Spirit will come alive through your words!! PS Listen to an inspiring worship song in the car and just let the words lift you up. Um, you were not late for church. You were just on the Murray arrival schedule. Totally acceptable. I know that you will do an awesome job speaking & look cute doing it. Oh I know exactly what you're going through with your Sunday struggles. My oldest, who is now 4, was THAT baby. The one who cried every time we took him to the nursery (and he went to daycare up until 9 months old, then I became a SAHM, and that still didn't help). He was also a "breath holder". So if he got really worked up, he would hold his breath and pass out (not intentionally, just a neuro issue he outgrew around 2). Don't tell me our nursery workers didn't dread seeing us coming on Sundays! I don't even know how many times they called me out because he had passed out and they wanted me to verify that he was ok. (He was.) Both of my boys are the babies who refused to sit in the carseats if they weren't latched into a moving vehicle. I was always so jealous of the parents whose babies would sit peacefully in their seat at a restaurant or at Walmart. As soon as we would sit the carseat down, they would start screaming. My second one is only 10 weeks so he hasn't been in the nursery yet, but he certainly doesn't sleep through church, he makes lots of noise and I end up in the foyer walking around till the invitation. So I definitely feel your pain girl! But it will eventually end. My oldest loves SS now and runs right in to play with his friends. Good luck with your speaking engagements! You'll do wonderfully. Kelly, I can totally relate about getting everyone ready and out of the house. It's a race from the time we get up. You really are wonderful at sharing, you are so genuine and honest. That truly means so much more than being a perfect speaker. I love the pics oh Harper! I love the picture of Harper. She is so precious! I am with you on the speaking but funny enough God has used me in that capacity so many times. I know you will do just fine because God will speak through you. I also taught preschool Sunday school and I was a nervous wreck but God blessed my class so much. I went from there to teaching youth girls and from there to teaching a women's Sunday school class for 5 years. I am waiting on God 's new direction for me. I am not sure what He wants me to do next. Praying God will place a peace all over you and calm your nerves as you speak this week! My son always freaked out in the church nursery, too. He'll be two in October, and he still cries when I leave him, but about 2 minutes after I'm gone he's fine. He even gives his teacher a kiss when we leave and talks about her all week long. It'll work itself out. He also acted crazy in public, and sometimes he still does. Just recently I realized most people aren't staring at you in judgement, just sympathy! It'll get better (I hope). First, I wanted to let you know that you will do wonderful in your speaking events. I have been asked on several occasions to do very large speaking events and I have to tell you it is one of my biggest fears. That's exactly why I agreed to do them. I was terrified and knew that once I agreed I couldn't go back. It would help me overcome this fear. I had to speak in front of 1,000 well-educated marketers. I was so scared. However, after 5 minutes into it, I felt this amazing calm and I was so glad that I did the first event and have done more since. You will be great! You have a wonderful story to share and people will connect with you. I promise, you will feel so fulfilled after doing it. I do know how you are feeling right now. As for Harper, time will make it better. It will get easier as she gets older!! Do you have anything that she absolutely loves from home that you could take with you to calm her (ie: a special baby doll, blanket, etc.) I pack a bag full of odd things when we go places and we go a lot. Avery loves shoes, containers, puffs to eat, etc so I pack all those things and usually, it these things she loves keep her content unless we run past our window of time. Good luck with your speeches and as always, Harper looks precious in that little turtle dress! God will give you the strength and words that you need! Yes I can TOTALLY Relate to you. When i graduated highschool I prayed and prayed to God to tell me what my mission in life was and a couple of weeks later the word Funeral Director poped up in my head and I was like NO WAY!! I would NEVER in a million years do that. I struggled for about 3 years with this, and my parents were even against the idea but God kept calling me and calling me. I went with it graduated from Dallas Institue of Funeral Service with the best grades I have ever made in my life and are going on 5 years in the funeral business. I have my days where I DO NOT want to play funeral director BUT I know I am serving my GOD and if this is what I am suppose to do, then I'll do it until God calls me to another job. Just my own thoughts/experience here but its just probably a really long morning for Miss Harper, the church nursery is probably so overstimulating and then to go out to lunch all while not napping may just be too much?! Thst how it was for all 3 of mine, sad and hard as it was my husband and I just took turns going to Church and the other styed home with the baby until they were ready to go w/ out morning nap. Or we would just do cjurch no ss or stay home from church, let the baby sleep and then go to ss...it will get better/easier, just remember she is a little person and brand new to our grown-up world - I wanted so badly w/ my first 2 to just fit into my world/schedule and now ith my third, we have slowed- down and are just enjoying the precious time w/ him...trying to do less and slow down. Good luck w/ your speaking - you'll do great! I definitely understand the stress of doing something God wants you to do, even when it is so uncomfortable. We are pursuing adoption because we know God has asked us to do it. We can't afford it and we are totally depending on Him to provide us the money to do what He asked us to do. I wish I could say my solid faith is just making this easy, but the truth is that I could have a panic attack right now!! Thank you for your blog and sharing pictures of sweet Harper. She is gorgeous! Kelly- I am so sorry to hear that you had a bad morning. Believe me, it happens to all of us- ESPECIALLY on Sunday mornings. I think Satan does whatever he can to make it a frazzled morning. God had been telling me to witness to this guy at the video game store where I take my son. I just knew I couldn't do it. I KNEW IT. But ya know, I did it and it turns out he goes to a local church...I was just nervous b/c I thought he would freak out on me...LOL! I just had to remember that maybe I was the last person that would speak Jesus to him...but God will give you the words to say, Kelly. He will. You may still be nervous...but the good thing about it all is that you know what you are talking about. The subject is familiar to you so finding the words should not be hard. so ironic that your post should touch on this. i just did my own blog about how i am constantly conflicted about being a working mom over staying at home. staying at home was always my dream, and i wish i could do it. i just don't know if i'm brave enough to take that step. living on one income sure scares me A LOT! and all the sacrifices that would require. so yes, i struggle ALL THE TIME with God's will for my life and whether or not i'm following it! Harper was an absolute doll the day we had lunch! I've worked in day cares and church nurseries and from my experience, it always seems much worse when it's your child than it is. People who work with children are used to them crying sometimes. And anyone who's had children can empathize. You are a GREAT mama girl. My little one hated going to church too. We were always called out of service to come calm her down. You are totally right about just working through it! She will eventually love it. My daughter is two now and RUNS to her class with barely a glance back at me. She will get there!! Kelly, once again you don't know me personally but I "met" your blog through Sara Campbell. PLEASE let me encourage you about Harper. I am a 50 year old mom whose four kids are grown/almost grown. My first one was a precious doll like your Harper. She was a . . . . should I say it . . . holy terror at times. :) Now, I know your Harper is not that way. My sweet Kathleen would not sleep through the night, the only way to get her to sleep was to put her in bed with us. I tried all the advice I was given. She wouldn't stay in the nursery, wouldn't be quiet in church, wouldn't sit still in restaurants for us to eat and the list goes on. You name it, she did it. Told us "no" right and left . . . and so on. You can ask Sara Campbell, who taught Kathleen in the 3rd grade at SBEC how she turned out. Angel is not even the word, and great student. She is now 22 years old and beginning her first year at law school. She graduated summa from undergrad school, got a full ride to law school, is both beautiful in looks and spirit. She is a dedicated Christian young woman who does not miss church, giving, or anything she can do to help someone. She is an absolute joy and couldn't be a better daughter. She is both kind and gentle. NOBODY, including Sara, believes she was once like I described. Looking back now, after having four, I realize that was Kathleen's personality. She did not like being alone, and still doesn't. She was very intelligent and thus very restless. She got bored easily. My only advice to you would be make up your mind that this is the way it is, make the best of it and make sure you teach Harper her manners as she begins to be old enough. It wasn't hard to teach Kathleen, she has always loved to learn. She was so good when someone was taking time with her. I totally understand and would just say you have an intelligent, capable young woman to be in your hands. Cherish her Kelly, as I know you do. She will grow up so fast. Kathleen just returned from France this summer studying French as a second language. She speaks, reads and writes French very well. She is a charming young lady that touches almost everyone's life she comes in contact with. The traits you are seeing in Harper are not bad traits, they have purpose. They may not be convenient at this age, but trust me they will develop along with Harper into the person she is meant to be. Oh, and I never left Kathleen in the nursery. I never trusted anyone enough . . . Ha! That caused me to missed part of every service for the first few years. Train her now, the way you want her to be and she will be that way. When my kids got out of the baby stage, every single one of them sat in church like stone statues as good as they could be. That takes a couple of years per child, but it is worth the effort. I have no doubt you will do great and your audience will be so blessed. I follow about 37 blogs and yours is my favorite. You have such a beautiful was of sharing and uplifting. It is so evident your heart for the Lord in your writing. You are very gifted. People need to hear what you have to say. You are like David . . . a women after God's own heart. Can't wait to hear how wonderful it was ! I'm also a mommmy of the screaming baby. Every Sunday when we go to pick him up he is usually riding around in the bye bye buggy or as my husband renamed it the bad buggy. HA! Oh and once he sees us he makes sure we know how upset he is with us for leaving him. My first son never cried so this is something we are trying to just get through. Hang in there and know that you're not alone, I'm totally feeling your pain over here in Texas! Our boys were both very sensitive to "smells", and the perfume the older ladies wore in the nursery set them off. We could tell because of the horrible red eyes they would get, the red swollen bags (not from crying). Since the ladies were hoping our boys would stop crying, they were happy to NOT wear perfume one weekend to see if it helped. And amazingly, it did! Then, to help matters even more, we would bring their own blanket and requested the ladies put these blankets over their clothes when they held the boys. This kept their "scented" detergent-washed clothes from setting off the boys. It worked!!! Do you wear perfume/cologne? Have you noticed if smells bother Harper? You might watch this, as you may want to light some scented candles as the holidays approach. If you do and she gets really cranky, won't sleep, etc. eliminate the smells. Trust me - you can have a new child! Imagine - if she's fine and then has to spend 2 hours around scents that just burn her eyes/throat, like her skin used to feel - no wonder that she couldn't sleep. She is a chemically and food sensitive baby - do "smells" also bother her? And to not completely overhwhelm you - do the ladies or janitors cover all the baby items in clorox each Monday to "clean" everything? Or possibly Saturday night? If so, there could be a heavy clorox or other serious chemical smell also setting her off. If you find these smells bother her, the smell of new clothes might also set her off. So if you go to the mall trying to look at clothes and she melts down, it could be that. To learn about these things and more (since you've already found she is allergic to foods and such), rent or invest in the life-changing book "IS THIS YOUR CHILD - Discovering and Treating Unrecognized Allergies" by Dr. Doris Rapp. Changed our life!!!! The only way our infants can communicate their discomfort is to cry. It's so sad, and drove me crazy wishing our boys didn't have to suffer. It's so nice when they can talk to us!! After I posted, I remembered a quote that Mike Clark used on his Facebook. He is an musician that plays at our church, his home church and others and I can say I have been so blessed with his music at our services. "God does not call the qualified, he qualifies the called". That has been on my mind and heart so much lately. I worked in our church nursery for over 5 years and still volunteer today and have put 3 kids thru the nursery and EVERY child is different. The main thing is consistancy is key, keep going back. The more routine she gets into the better she may get. Is there something she holds dear to her (blanket, toy, etc...) and will the nursery let her bring it in with her? some times that helps. Is there one person that is always there? Maybe she can learn to attach to that person or she may not like that person (I know many a child that would see me in the store and associate me to the church nursery and start crying but then there were the ones that would come running it just depends.) Time and consistancy is the main thing...don't give up if you want her in the nursery. The workers are there for you, our goal was for our moms to have an hour with Jesus just to relax and enjoy Him. Hang in there this too will pass.. Sorry if this posted twice having problems with my computer. Kelly~ I doubt you'll even see this, but feel led to share it just the same. The very first time the Lord ever called me to speak it was in front of our entire mid-week congregation and it was to share on the anniversary of Roe v. Wade because of my testimony with my abortion from before I was a Christian. When the night finally came I was so nervous, I was physically shaking and when I got up on stage I was so nervous and shaking. I finally just stopped a moment and whispered a prayer, "Lord may I decrease that you may increase, speak through me." I spoke for 45 minutes, I just kept talking. I don't even know what I said, the annointing just came. 45 minutes later, I was done, and I could almost feel it disappear. I said, "thank you very much," and I left the stage. I never went before a group again without praying that prayer BEFORE climbing a stage or standing up in front of a group. (The moments up there that first time before I prayed it were so very long and painful, ha ha). In 12 years of sharing and speaking opportunities, God has NEVER failed to show up with His anointing. He will show up for you too (but definitely pray it in advance!) Remember, He will show up not only because he wants to bless you, but also He will show up to bless everyone He's brought to hear you speak as well. It will be anoiunted and blessed! Sundays are our most stressful day as well - my husband preaches and I am often left by myself to care for my little one during the sermon - and sometimes he likes to act out as well. Getting ready to go is the biggest exercise for me, though! Just pray and pray and pray about your speaking engagement. . . you'll do fine! There is hope! My 4 year old was such a nightmare in the nursery that I had to stop going (for about 6 months - I am still working on getting my hubby to go with us). It was hard for me, but I waited until she could better understand and was old enough to go to Sunday School and now she enjoys church - we are just having issues getting her do dress "properly" for Jesus. My younger daughter has loved the nursery from day 1 and she is definately one of the easy one's. It is so funny because I could tell that Lilly was a challenge for the workers, and Anna is so easy that the "fight" over who get's to take her. Your 2nd will be easier!!!! God Bless! You are going to do so well!! I taught high school and Kindergarten, and I felt like that ALL the time! God will be with you, speaking through you and giving you what you need to feel at ease. For me, it was a student smiling back--that always made me feel great. I am a military wife and we are struggling to find a new church at our new post. It's harder for me to hear what God wants from me when I'm not totally "plugged in" to his community. So lately, I've been doing a personal Bible study to continue to hear him. I look forward to reading your posts! You are such an inspiration for me as a Christian mom and new blogger. Thank you for all that you do. Jesus shines through you. Kelly, from what I know about you, you ARE a GREAT mom. Don't let things that you can not control, such as Harper's reaction to the the nursery, influence the way you feel about yourself as a mom! Look at how much love Harper feels every single day and let THAT be your measurement tool. Honestly, she will get used to it and love it one day. I love her little outfit and that first picture is outstanding. I think it is a mistake to feel babies have to be dressed up to go to the nursery at church. They should be dressed in their comfy clothes, not their "Sunday Best". In the end, isn't dressing them up because you want other people to say how cute she is, and isn't that prideful? And forget the photos ahead of church. Just focus on all being comfortably dressed and getting there. Then skip the restaurant after church. Go home and feed Harper in her familiar surroundings and get her in for a nap. Babies like their home routines. She is very cute! But I think she is a lot cuter without the bows. She looks adorable just in her jammies or a simple dress. You are not alone in your feelings with Harper and going out in public. I struggle with this daily. My daughter is a little high strung! My SIL(who has 2 boys) swears she has the energy of a boy! I have recently had a "come to Jesus moment" in realizing my sweet girl is not the child I invisioned her to be, all sweet and layed back like me :) But that is who she is and the only thing I can say is... That is why I am a Mother, to adapt to my child and learn their personality amd make due with what God has given me! With that said, they are amazing little people and We are all so blessed. Hang in there! The love you have for Harper is so beautiful and don't ever feel that you are a bad Mother for having these feelings! That picture of Harper is soooo sweet! You must frame that one!! It is totally normal (and developmentally appropriate) for babies to have separation anxiety at this point. It is so typical and expected. :o) Around 6-8 months of age, babies begin to realize that the parent can separate from them--even if for just short moments. This is also when the separation anxiety comes into play. My first baby would always cry when she transitioned to new places--to sunday school or if we brought her with us to dinner or to a friend's house. I had to adhere to a strict schedule with her (my other daughter was way more flexible). As a baby, anything out of my older daughter's usual routine sent her into a total tailspin. I really think she sensed when the surroundings were new and she was so sensitive to noise. She could also sense when I was stressed and that made her worse. I remember things getting better (like I could finally take a breath in public with her) around age 1. She just seemed to be better when she could walk and start to explore her surrounding. My daughter is now almost 8 and still has her own little way of wanting things done and loves to run the show (LOL), but she is definitely more receptive to transitions and loves being social on the go. Don't let it worry you...she is beautiful and it is all part of developing. Hang in there, honey. HUGS! I have you in my prayers, too. While I can most definitely sympathize with your fear of public speaking, I have read your blog for a while now and you have so much to say and you say it so well. You have a wonderful, beautiful testimony to tell and God will be there with you helping you tell it. I think Harper is in panic mode in the nursery because you are not there. Can you imagine being so frightened when your little world is turned upside down and the one thing you know and love best is nowhere in site for what seems to be a very long time. You might consider leaving her for 10-15 minutes with a trusted friend, not family and not a friend that she knows really well, some different friends during the week, on non-church days. When she gets used to that, extend it to 20-30 minutes, etc. Possibly even a really good Mothers-Day-Out program for a little while. Just something to let her see that you are not abandoning her, that you will be back for her and that she can have a good time while you are gone. Just a suggestion - my daughter was very dependent on her dad and me and it was so hard on her when we had to be separated. She is grown now and well adjusted but I still remember these traumatic times. I am glad the storm passed as we went to the sermon which was about going through the motions (song by Matthew West, I think). The minister talked about how we each have gifts and that we should not just go through the motions and stay in our comfort zone. We should listen to God and take a chance. Move into the unknown if God wants to use your gifts someplace that you would never voluntarily seek out. It sounds like your gifts will be used tomorrow! I will pray for you. I know your family's faith and the story of your beautiful daughter Harper has inspired me to look at my life and take a breath and give more praise to the Creator! Thank you for sharing on your blog! Peace tomorrow. I have heard my pastor say many times, " God doesnt call the equipped, He equips the called." He will give you the words to say and will give you peace and strength to do His work. Even if one person is touched by what you say, it will be worth it. Saying a prayer for you. Harper is beautiful. Is this when you are going to be in our town!? If so, we'd LOVE to see you--but we totally understand if your schedule doesn't work out. You can text me or call me or anything if you have a few minutes and want to drop by (my house might be a mess--probably will be!) but that's fine--or we can meet you out and about somewhere for coffee, etc. Again, don't feel like you have to call--I completely understand if it's too rushed--I know how it is to try to work around nap schedules, eating schedules, etc. etc. :) Just let us know if it works out! I know you'll do GREAT at your speaking engagements!!! I'll pray that the words come easily and that you're calm and at peace! I feel the same way about homeschooling....something in a zillion years I never thought I'd do....and yet here I am, woefully unprepared....but yet there's this 'thrill' that I KNOW this is God's plan, and it feels good to be obedient! forgot to mention earlier--Is Harper teething? My baby is super cranky and clingy when teething. Cute photos! I believe Harper is not capable of taking a bad photo, just like her mommy. I am so there with you on Sundays! This was the first Sunday that I wasn't called out of the service to get my baby girl. She gets so thrown off in there because she misses a nap, and by the time I get to her she is screaming her head off. Lots of parents at my church have told me it took there little ones to adjust to a different schedule on Sundays. As far as God's will, I do struggle with that at times, too. Right now I know it is his will for me to be staying at home with my baby...but I don't know for how long or what I will "do" next. I am a former kinder teacher, but I am not sure I want to go back to the classroom. I believe He has placed a few dreams in my heart regarding the future, and I want to take this school year to seek His direction. Love that pic of Harper. Kelly - I'm not even going to read what the 106 people before me wrote - but I wanted to say that maybe there is someone in particular that Harper doesn't like in the nursery at church. Is it ALWAYS the same people, is it someone who loves Harper but is so afraid of her maybe starting to cry that they get nervous, which makes Harper nervous, which results in crying? She seriously cannot be the only child in a bad mood in the church nursery. Does she cry on the way to the nursery? Or when she see's that you are heading that way? If yes, I'd say it's someone or some thing in that room - kids are great with their instincts. Not that anyone ever would hurt her - but my son used to scream bloody murder when we turned down the road to his babysitters house - after 1 week of this and some unexplained this and that's, we left. Don't be scared - just be watchful. Oh, Kelly! After reading this post I knew I had to write. I have 3 sons-22, 20 & 18. Our first son was the perfect child. No, really. He slept through the night at 2 weeks, we could go anywhere, movies, out to dinner, shopping. He was always good and calm. I could not understand what the big deal was when I would hear parents complain. Then we had our second son. He was the exact opposite. Did not sleep all the way through the night until he WAS FOUR!!! We could not take him anywhere at all. He was the worst behaved baby ever. Then I "got it". I knew how blessed we had been with our first and how our second was an equal blessing, but just in a different way. It taught me patience I never knew I had. You will get through this, you are not alone. I know for a fact that every single person that was staring in the restaurant has been there or knows someone who has. Trust me one day you will turn around and wish for these days. Enjoy ever the good ones, they go way too fast! You are not alone. Sunday's are always one of the worst mornings around here. My husband plays on the worship team so I'm usually home getting the kids to church by myself. There is always tears, hurrying..no matter how early we all get up, and angry words. Hang in there. Keep putting Harper in the nursery. Sundays are hard because everyone is missing naps, routines, etc. Keep trying. I know you will do a great job speaking! Your blog is great and reaches so many people. I am not a public speaker by no means but I gave my testimony at church last week. It was not by anything I did, God gave me the words to speak and took my nervousness away. Once you get up there you'll be fine! I'm sure others have already said this but God doesn't call the qualified, he qualifies the called. You'll do great! hi kelly, i am stay at home mom to a spirited 19 month old boy and I love your blog. i am so sorry you had a tough day today, but i have come to learn that satan uses his best "tricks" on Sundays (the Lords day) to get us frazzelled and discourage us...I do not know you personally, but I know you are a great mom...Harper will come around to church and other things in her own time (i am sure you have heard that before) but believe me...I had the same doubts and questions about our little one...he is the "spirited one" not as content as the other babies...but it has gotten so much better the older he gets....i said a prayer for you that the Lord would give your heart peace in knowing you are following him with all of your heart and HE will show you exactly what to do to help miss harper in this journey of life!!! thanks for sharing your journey with us!! Hi Kelly - I nominated you for the Honest Scrap award! See my latest post for details. Your mom already mentioned the great example of Moses. Don't forget about David, too. All he had was a slingshot! If he could do it, so can you! Stepping out of your comfort zone IS scary. I know b/c I am doing it right now by starting a new job. Many times I wonder what in the world God is doing in choosing me for a task that I do not feel equipped for. Doing things that we don't feel prepared for are great reminders of How much we need His grace and guidance daily. Remember the will of God will not take you where the grace of God cannot protect you and Phil. 4:13: You CAN do all things through Christ who strengthens YOU! You'll do great! You are doing a great job! Just hang in there. I find that Sunday mornings go better when I get up earlier. I know, not fun, but it works. I try to get up by 6:00 am, and this is with all of our clothes ready if possible. Then, I can get ready and then be ready to calmly eat with my four kids and help them get ready. When we have the rushed mornings (and we often do), none of my kids get any mama time. The five-year-old and twenty month old still need "mama time" in the morning. This may be nothing more than our usual routine, a calm breakfast, me helping them get dressed, etc. Daddy can do all of these things and does when he can, but they are just not used to it since he goes to work at 6:00 am. I think that when the little ones feel like they have had my attention, then they are ready to take on the day. We homeschool so going to Bible class is a big deal for the little ones. Not only do they not have mama, but they don't have their siblings either! So, I say all that to say you might try your darndest to get up and be ready to take it slow in the morning with sweet little Harper. I know this is not always possible as she is so little (you never know how much sleep you will get or what time she'll get up! ), but it will get easier, I promise! I try to do this whenever we are getting out of the house early whether it be church, preschool (when we did that), or other activites. As for wondering God's will for my life, this is a huge struggle for me! I grew up in the same house that my parents still live in. Our family has moved thirteen times and is getting ready to move the fourteenth time. It has been so hard for me to have family traditions, houses the way I want them, etc. When we move, it is all about survival in a new place! At first I was mad! While I knew this was my husbands choice of careers and it allows me to stay home, I felt like I couldn't give my children what me and my husband both had. Over time, I have learned to accept and rejoice in it. It is easier now that I can look back and see all the blessings we have had at each stop. Blessings that would not have been possible had we stayed put in one place. Now I can see that both ways can be successful ways to raise kids. My kids may not have had the Christmas tree in the same place every year, but they have traveled the country and are super-flexible outgoing kids (which I was not!). I still wonder why He has the plan for us that he has, but I am just accepting it doing what He leads us to do. Yes, sometimes it is scary and I have to get out of my comfort zone, but it is so worth it! You don't grow if you don't stretch yourself. I know you will do a great job at your speaking engagements. I think from what I read, you were definately meant to do this! Have fun! Kelly, God gave you a special purpose the day Harper was born. Frist to be her mom and then to take his word and miracle to the people. Have you ever said...Here I am God send Me? Well, God is now sending you. Not the way you probably hoped, but the way he needs you to be there for him. Therefore, I know you will touch the hearts of everyone and you will do it with the love of God. Go forth and speak from your heart. Hey Kelly. Me and my husband are the nursery coordinators at a large church (1500+ members) in Indiana. We run into fussy babies who hate the nursery all the time! Here are some suggestions. Harper is used to being around you all the time...of course she's upset that your leaving her! We really encourage parents to NOT come check on their children between services. Here's why....If Harper cries and carries on, and you come and calm her down, them she learns that if she cries you'll come. She's a little sponge right now and your teaching her that you'll come and get her if she cries for long enough.... I know that you feel bad letting her cry and carry on, but she is going to be upset regardless. From experience, I would suggest not checking in on her. The workers will come get you (or page you?) if you are needed. It just frustrates her and confuses her :) She figured out that you came because she was crying and then will continue to cry in hope that you come again....The workers will eventually be able to calm her and/or she'll learn that the nursery isn't so bad afterall. Now, we have some kids who hate the nursery all the way through. But we learn to calm them....bubbles, music, cheerios, stroller ride...etc and they eventually learn to tolerate us :) From experience, I AM POSITIVE that it'll get better with time. I hope my suggestions help. I have three boys myself and have had my share of babies who hate being left! Don't let the stress of it get to you....these workers are there to lovingly serve your family. Take the break as a welcome breath of fresh air. There are reasons God created babies with no long term memories! Looking forward to hearing how Harper grows to love the nursery in the future! First of all, Harper looks precious! Sundays can be stressful for us, too! =( You are going to do great with your speeches. I was a wreck when I had to do those little speeches at the capitol. I just tried to remind myself it is "our" story and someone needs to hear it. That's why I was doing it. God will work through you I just know it! Take a deep breath and just tell your story. You'll be great!!! And, you will feel AMAZING when it is over and you'll be so glad you did it! Let us know how it goes! I felt the Lord leading me to share His Son with our MOPS group last year. I am also not a speaker (although somehow I have lots to say usually, but not in front of a group) ha! I believe the best thing to do is to have people praying for you to share what God wants you to share, and to keep back what He doesn't wish you to share. Then you will know you have been obedient and whatever comes out of it will be for His purposes, not ours. I know you will be just lovely. Also, two great books I can recommend: Healthy Sleep Habits, Happy Child and also The Highly Sensitive Child. My first child seems similar to Harper. The church nursery was awful ... but it was because of the changes that were occurring in that room during just two hours. When you know what to look for, it makes sense why a sensitive baby cries. (Not ALWAYS, but these books did help)! I think my biggest problem is actually listening to God, I hear Him...just not always listening, but I'm working on it! If it makes you feel any better, both of my kids HATED being away from me until they were around oh, 18 months or so. My second was much more willing as long as she could be with her big brother. Hang in there! Sundays are just not for small children! It absolutely is the least restful day for moms. From your comment, I'm wondering if there is just too much stimulus right now for Harper. Our niece did not like crowds or loud people (which excluded huge portions of both sides of her family!). However, she grew out of it around a year old, but before that, she like people on her terms and her turf. I'll be praying for all of you as this time is so important for you to have and she will grow to love it - on her terms! : ) Another joy of motherhood. I LOVE these pictures. I will be praying for you the next couple of days. When I first started working at FBC, the twins were 2 years old and all of the sudden, they decided they didn't want to go to church so I would literally have to peel them off of my leg and almost push them in their SS class and shut the door real quick. I was SO embarassed! All the workers gave me a heads up if the class would come down the hall and I would have to hide! I never figured out why they were having a hard time, but they eventually grew out of it and so will Harper. Believe me, she is not the only child who cries during the service - she is such a cutie! I'll be praying for you this week! I'm going through the same thing with my 14 month old right now. She has NEVER liked the nursery. As soon as we step foot in the nursery she cries! My husband and I do children's church every Sunday and it is REALLY hard having her in there with us! The people in our nursery page us after 5 minutes because she is so upset! I went through this with my older daughter, who is now 5. What cured her was putting her in Mother's Day out once a week. The first few times were bad, but she eventually quite crying and would go in the nursery at church. I need to get my little in into a Mother's Day out program for just once a week to hopefully solve our crying issue! Wanted to share this link too. Anytime I speak in front of a large group I say these words to myself as a pray "give me words to speak..."
You'll do great because God will speak through you! If you can 1) give birth and 2) be interviewed for television, you can do anything. I'll be praying for you while your speaking. I know how you feel, I hate speaking in front of a group and get SO nervous. But with my girlfriends, I can never shut up! Ha. Funny how that is. Good luck this week! I'll keep you in my prayers. I'm sure God will use your words in a mighty way. Remember that God told us "think not of what you will say in those days, for I will put the words in your mouth"!!! He will work through you for you!! You will do great! As for Harper in public don't worry about it. My oldest was the same way and I was so frustrated when I would go out. My mom finally told me "Every mother has been there, and every mother that is looking at you is thinking "BOY HAVE I BEEN THERE!!". She was right, and it is okay now. This to shall pass! I have and still do struggle with God's will in my life. I'm with you when you say it must be something God wants you to do because you SO don't want to do it!! I've felt like that quite often. The most important thing I've found is to just make yourself available to God. Which is what you're doing. It's amazing how He can use us in the smallest and biggest of ways, and if we just remain humble He ALWAYS gets the glory. Good luck speaking this week. I'll be praying for you. I am the 134th commenter on this particular post...so I am sure you probably can't answer, but if you get a second, I would love to know where you got the chair for Harper? From what I can tell, it looks like it has the song "Jesus Loves Me" painted on it, and I just would LOVE to look into getting one for our baby girl due in November. We have 2 boys, ages 3 and 1, and so I am going crazy when it comes to buying for a girl, and I think this is too cute to pass up! Thanks so much! Blessings on your this week. You and Harper...and Scott!...are all precious. Thanks again for sharing your lives with us! Kim Watson (Email: kjcwatson at yahoo dot com). you are not alone! on having to step outside of your comfort zone to speak AND on having a girl that does not agree with the nursery. just said a prayer that the speaking goes beautifully and that sweet harper adjusts soon. you are a WONDERFUL mom and instrument for God! I always feel like we go to Hell trying to get to church. Never are our attitudes as terrible or gripes as loud. It's spiritual warfare at it's best - every Sunday about 9:15 a.m. I'm speaking tomorrow night too for something the Lord has clearly called me to do, and honestly I'd rather clean a toilet (and that says a lot). I HATE speaking in front of a crowd. I'll be praying for you! My oldest little boy screamed every time we left him in the nursery from 5 months old until he was 18 months old. We even put him in a Mom's Day Out program 2 days a week & even that didn't help with his separation anxiety. Then it was like a light went on & he started liking the nursery right around 18 months. He is turning 5 in two weeks & now he begs to go to church & is my little social butterfly. I know it's hard but just know that it will eventually end! God Bless & I'll be praying for you!! Keep the faith! You (or Harper) are just in a rough patch/phase and it won't be the last. Hang in there and pray for patience. Good luck with your speaking- you will do awesome. I just LOVED your mom's comment, what an encouragement! Will be praying for you!! I am right there with you!! HATE speaking in public. My best "calming aid" is a bottle of..PEPTO! Yep! I just about died teaching a SS lesson to 1st graders in front of ONE other adult! So, my dear, I feel your pain!! Hang in there, it will be over before you know it, and you will bless so many people in the meantime! Kelly, I agree with the other women that say Harper is just going through separation anxiety while you're at church. I have worked in my church nursery for many years as well as in childcare and with sahm's this seems to be why children tend to get so upset. As one of your readers mentioned earlier, this is the only time that Harper is without you and it's tough (for both of you!). As hard as it may be though, I suggest that you don't go to check on her in between Sunday School and church. It may calm her down for a few minutes, but probably causes her to get even more upset the second time you walk out the door (from my experience, anyway). Eventually, she will get used to being dropped off, but is reassured that you WILL come back! It may take a few months, but she will come around, I promise! I will continue to pray for you and Harper and that your Sunday's become less stressful! First of all, you are not alone. It is sad that Sunday's are so often such a stressful day. Don't worry...CONSISTENCY IS THE KEY!! It may take a few more weeks or as long as a couple more years, but Harper will get used to it and be just fine. Don't give up. I always tell my 8 year old daughter when she is frustrated about something -- "Anything that really means something to you requires patience and a lot of work. All things are difficult before they are easy." I find that quote works just as well with myself in my adult life too. We all have days like you've had. Just hang in there! Good luck with your speaking engagments. You will be great! And, all this time I thought I had the only girlie who screamed in nursery! She is 13 now (and, no longer screaming ... HA!) ... she is an only and still doesn't enjoy hoopla or noise. To give you hope ... she did come to enjoy the nursery and looked forward to seeing her friends. Hang in there! I have a two-year-old and a one-year-old. Church is my least favorite part of the week. Sad, but true. You are not alone. I just know that some day (in the hopefully not too distant future) it will be better. Maybe I can even go back to taking a nap after church. A girl can dream! Um, my oldest son was the one who went running and screaming out of the preschool sunday school room for weeks after his transition there from the nursery.... His first sunday school teacher recently told me that she made him her "project" and committed to teaching sunday school every week until he was comfortable (we usually sign up for 2 wk blocks). It was the sweetest thing ever. Now he's 6 and his teachers tell me how fantastic he is in sunday school, how he participates and always offers to answer questions... It just took time. Your nursery people sound so fantastic. You just can't beat people that you can trust. Try not to stress and just know that you are doing your best for her! I am praying for you! "God equips the called" and he has called you to these speaking engagments, so will equip you, just like he did Moses, Nehemiah, Paul, etc. I specifically think of Nehemiah and how his face literally showed fear, but he was honest like you are, and looked to God over and over, and prayed and God really did the rest. He said "yes" like you Kelly! That is what you are doing Kelly, saying yes, and that is all God is asking you. He will use your yes and do the rest. He will bring glory through your yes! I really don't claim to know much as far as parenting, but I just want to encourage you to continue to give yourself loads of grace as far as Harper. My oldest, who is 14 now, was so discontent often times in the church nursery when he was a baby and even a toddler. Looking back now, I realize he had a Godly strong-will, which was heart-breaking (performance-wise) and brought many tears when he was a baby (because it was humbling), but now God is using it mightily! I just did not understand why and get it, because we did all of it, like Baby-Wise/Scheduling/Parenting with Love and Logic, etc. and it did not fall into place. My other two girls (Caleb's younger siblings) were excellent and compliant when we were out and about. When Caleb was a baby, he just seemed to get overwhelmed when we were out, in certain sutuations. He, like Harper, was a NICU baby and he would get overstimulated and then just fuss. I would leave feeling overwhelmed and sad, because he was my first born baby and I just could not make sense out of it. I am not saying Harper is, but looking back I realize my first born was so high maintanence and it was sooo tough and humbling for us. God was breaking us of what others thought. He wanted us to learn to "live to an audience of one-Jesus". I often times just could not make sense of it all when we left church, playgroup, bible study, etc. Now, he is the most incredible teenager and God continues to use his personality in ways I could never have imagined or dreamed of! God has taken his intensity, energy, and personality and continues to use it to do amazing things to minister to his youth group and so many non-Christians. God has taken his personality and is using it in ways I never could have built into Caleb! God has taken his con-conformist spirit and used it all to bring glory to himself. I just keep praying and hoping it stays that way! Now I am thankful that he was not content, because I see God using it to keep him from conforming! God gives our kids these inborn/inate personalities and can do amazing things! I just want to encourage you to keep surrendering Harper and all of it to God! I can tell, you are amazing parents and doing all God has called you to do! I want you to rest in that! I pray God will bless you for your humility and transparency! Will pray for your speaking opportunities. I teach public speaking at Houston Baptist University and I always tell my students ... if you are just yourself, and tell your stories the audience will love you. Your story is fascinating and I'll pray that the Lord will put the words in your mouth. I think I'm the only one ... and it's probably b/c my oldest was a lot like Harper ... Momma's girl! ... but I'm so curious about you leaving her for your trip with CI. Is she fine being left with your parents ... it's only the church nursery? Hope so!!! :) Are you planning on weaning her before you go? I think you will do great! Just talk to them like they are your best friends and soon you will forget about the "public" speaking and you will just be talking. Now I really don't know you but I am a guesing that you like to talk. Your bubbly personality just oozes from your blog. Plus they are there because they want to hear you talk! It is a win, win! I have done a little public speaking and I am usually nervous at first but once I get going I love being able to share all that God has done for me. PS Harper is a darling! Just remember this too shall pass! It just comes with the territory. It'll get better. I'll be praying specifically for you about your speech. As a mom of 3 kids, I just had to offer a note of encouragement. My first child was EXTREMELY fussy and threw terrible fits as a toddler. But it was because he is such a sensitive child and it was so frustrating for him to not be able to communicate. The older he got the easier he got. And now at the age of 6 he is a DELIGHT. My easiest child--because of his sensitivity, he's compassionate and thoughtful. Because of his need for routine and structure, he follows boundaries and rules easily. I would do it all over again in a second to have another child like him. I hope that helps. Stay the course, you're a wonderful Mom and Harper will love church someday (my little man does, and he too was always the screamer--in every group--as a baby). :) Oh--and the second child was a dream baby. SO easy. (He gets more challenging the older he gets!) You just never know! Isn't parenting an adventure? Good luck with your talk, you'll do GREAT. Kelly- We had baby dedication at our Church this weekend and it is too funny bc everything you mentioned in your post was spoken on at one point or another throughout the festivities!! Our Kayle is similar to Harper in public. The preacher that spoke over us described those type things as "events" that we will all later look back on and more than likely laugh. As he said, every day is full of events and we will be on to a whole different set soon. This morning we were taught on our calling to disciple to others, and how scary it can be to do that. Especially when its to people we don't know. The bottom line to all of that was that we may feel like we dont know what to say, but all it really takes to bring people to Jesus is our story. You have a wonderful beautiful story with Harper that continues to be a testament to Jesus every day! Between Him and a hug from that precious baby you've got what you need girl! You will do great, and I am sure I speak for everyone when I say we cant wait to hear how it goes!! Wanted to tell you that I did a Zebra baby shower on Saturday! It turned out so cute. Thought you may like to see some of the pictures! That is how it is here every Sunday with our little baby! I have not even put her in the nursery because of so many outbreaks of swine flu where we live. The bad thing is she loves to sing and wants to continue even after everyone else is done! ha! You will do great at the talks....Just be yourself. I love reading your blog...God's love shines through you and it will continue to shine while you give your story. God has a way of working these things out!!! Good luck! Kelly, my heart went out to you reading about that awful Sunday with Harper being so upset, on a day which is meant to bring you peace and rest. A question? Is it a rule that Harper HAS to be in the church nursery? From our second child onwards, we have taken our youngest to church in a pram up to around the age of 18 months to 2 years. They feel secure as they are with us, they get used to sitting up in Church, and soaking up the worship, not to mention you can hide all sorts of quiet toys and board books in a pram. I would sit where there is plenty of room, and if bubs got a little noisy a liitle pram motion usually worked. I don't know if this is possible in your situation, and I kmow that you would still have to take her out to feed her, just thought I'd share something that worked for us. By the age of 3, daughter no.2 would sit quietly in her seat all through church reading her picture Bible, while our older girl, who we used the nursery creche for at another church earlier, took a little longer to get used to big Church. You'll do fine at your speaking engagement(after all you've already done TV NEWS!) God will enable you and fill your mouth with what he wants you to share. Bless you for the blessing you are to Mum's everywhere. just so you feel better about the nursery situation...you are just too good of a mama, i can't blame her for wanting to be with you. mine were the same way, and seventeen years later they still love to be around their mama. it's a good thing, enjoy knowing that you are the BEST and that your little girl KNOwS it!!! I hear you on leaving the baby in nursery. My first was like that. So we would take him to sunday school w/ us and then only leave him for service. But it was easy for us, cause we taught the highschool kids, and they didn't care if our baby was there or not. On the whole doing something that God is leading you to do, but TOTALLY not comfortable w/ it. We're going thru this right now. We felt the Lord was leading my husband to go on a very short mission trip to Slovakia, and he's doing it. I'm a nervous wrek about it. So's he. He doesn't like leaving the country w/out us, and will miss our boys terribly. They're 4 and 1. I'm so scared he won't return for some odd reason. But we know this an obediant response to God's call, so we are confident we will be blessed by it. So I know public speaking is hard, but I know others will be blessed by what you have to say. Praying for you! Oh and ONE more thing...It is a struggle getting a little one ready for church and there on time. I struggle with it EVERY Sunday..not gonna kid ya. One thing I know, however; that taking my sweet son to church from birth on will CHANGE his life. It's easy to want to sit at home because it's more convienent or because it's stressful getting everything packed and ready, but I always try to think about how going to church will help my son all his life. You're "that" kind of mama too. Please be encouraged. God understands. I'm hardly EVER on time anymore now that I'm a mama. I really do try too. To me THAT's extremely frusterating, but I don't stop trying. Just keep on trucking girl. Take that sweet Harper to church, and the end result will be amazing!! God bless!!! Harper is just such a cutie.. It will get better. It's best to focus on what you have and not what you don't have..like not on having the "perfect" child. Just go w/the flow. Just consider what Patrice is going through w/poor little Jonah. I go to Fellowship Church in Grapevine, Texas. It is a huge church. My husband teaches several classes there. I am NOT a public speaker. Terrified. I was asked to speak about being a foster parents to 60 newborns in the parenting class. I wanted to say NO NO NO, but I had this little nudging from God saying, I allowed you to go through this experience to share with others and help them. I have done this about 10 times. I walk away thinking I did a terrible job, but I know I have done it for God, and that makes me happy. In my own strength, I can't do it, but I know that I should. Hope that helps. Kelly, you have such an amazing story. Just speak from your heart.... GOD will do the rest! I'll be praying for ya! You'll probably have to just keep leaving her in the nursery. I am a working mom so I felt HORRIBLE leaving my kid for another few hours a week, so we brought her in the service with us until she was about 7 months old. Just make your good-bye's very quick (but don't sneak out - that makes the anxiety for them worse). As far as dining out, I just always make sure I have something for my kiddo to do. It usually also involves eating. I never feed her ahead of time. Sure, I may not get to eat as much but usually she is so entertained by eating that she's not screaming. Harper will grow up soon and these memories will fade as well! Beautiful pics of Harper!! You know Kelly I remember with my first daughter she went to daycare at a very young age, and at the end of the day she wouldn't come to me and she would scream at home. It broke my heart so I know it's hard be blessed knowing your daughter loves her momma and her home. That's why with our second child I felt led to stay home and God will provide for us and find a way to make it work. Sounds like you should go into any of these speaking engagements with a lot of joy and just be thrilled that God chose you to deliver such a wonderful message. Normally I can't stand public speaking but when I talk about my Lord my heart opens up and the words come so easy it makes me laugh!! Go for it and I'll pray for you!! We give our daughter snacks like puffs, mum-mums and cheerios when we are out in public and she melts down. I really think that she is hungry and needs to snack every 2 hours anyway. She is 12 months old. That little dress is so very cute! What a cute idea for a rocking chair...it is so adorable! I will be praying for you today as you step out of your "comfort zone"...you will do great! "I want so badly to be a good mom and to have a sweet child." This is the part of being a first time mom that is the hardest...GUILT. Her screaming and crying isn't a reflection on your parenting. Some kids are just wired this way. I have two of them...one who screamed more than the other. It will get better. Just keep doing what you are doing. I was so glad I lived near my parents when my son was a baby because he had horrible seperation anxiety. When I would get frazzled she would take him and he would scream the entire time and she didn't mind and it was so worth it for me. You are a great mom...please remember that. Your Sunday morning sound all too familiar to me. We went through the same thing with our daughter. It was getting too hard for her and for me on sunday mornings, so my husband suggested a mother's morning out program to get her used to me dropping her off. I wasn't big on the idea, but at that point I would give anything a chance. I started taking her once a week, and the first couple of weeks were tough, but then she adjusted and began to enjoy it. Now she's in preschool and hasn't cried since that first day. So, I promise, there is hope, it will get better. Just hang in there. I'll be praying for your speaking engagements. They say misery loves company. I hate you are going through what I did with my first. And no, I don't have any answers except to say I've been there and it does get better. I could not leave mine for one second in fact she clung to me I assume because I stayed home with her 24/7. I also think it was because we did not live around family. No one else held her except me and her Daddy for almost 2 years! I can tell you she is in first grade and still has some seperation anxiety. It breaks my heart that she doesn't want to leave me and do fun things sometimes. We moved closer to family and the next 2 babies will go to anyone and never cried like she did when I left her. I have no idea if all the socialization helped or if that is just the personalities God has given them.I tried to socialize the first with playgroups, gymboree classes, church, but she would never readily let go of me. I know it makes for an exhausted, tired, worried momma but things will get easier. (I remember I held her when she was 18 months old in my sisters wedding for 4 hours because she didn't want anyone else to try and hold her, etc. I thought my arm might fall off!) And the good news is, if you have another it will be completely opposite. That's kind of nice to experience the difference. I really thought I was doing something wrong but after having more children it's easy to see they are just all unique. Good luck with your speaking! I love your blog and have never commented before but want to offer you some encouragement today! I am the mom of 4 boys(now teenagers) including twins and have felt your "Sunday visits from Satan himself" working with all his might to keep God's children out of the church doors! Don't give him the victory!! I would recommend putting Harper in a Moms Day Out program or leaving her with a friend at least two days a week. One day a week does not give her enough familiarity to be comfortable being separated from you. When switched my first one from one to two days in a Moms Day Out program it helped immediately. Also, I love working in the nursery, I love the "high maintainence" little ones because I empathize with them and their mommies! I bet someone in your nursery loves holding her, tears and all! You need the break from her especially as a SAHM. I have been a SAHM for 20 years now, without those "sanity breaks" I would have been a worse wreck than I already was especially in those infant years!! You are a great mommy and Harper is just a normal, great baby! Isn't it flattering to know she misses you so much! For restaurants, we always got drive thru service or fast food after church. Harper is worn out from being left, probably hungry and needing a nap and TLC in your arms. 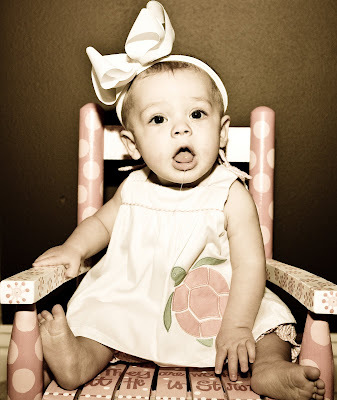 Babies her age should be restless, loud, chatty, and even wild after 10 minutes in a high chair, she is perfect!!!! I love your honesty and your daily posts, thanks for allowing complete strangers like me to glimpse at your stories and insights! By the way, I somehow found you off Beth or Amanda's blogs!! Glad I did. My "kids" are all grown now and I totally agree with Eva from Knoxville. We had our 3 in 4 yrs. and getting to church was awful on Sunday a.m. Then you have to sit there and worship....hard to do at times. Just remember you are doing a great job and Harper is a healthy baby girl just doing what she should be doing. You might try the MDO...I did and it, too, saved my sanity! Bless you in your speaking engagements....God gave you this story to tell. BTW Harper's outifit is totally adorable! Kelly, I know you will do a wonderful job speaking. God will give you the words. I heard once how he calls us to do what he knows we can do even though we think we can't. Also, my son cried in the nursery every Sunday until he was with the walking babies. He just liked the bigger kids! Happy speaking! Know you will be blessed. We have a saying at out house about Sunday mornings. EVERY Sunday we are "tripping over Satan" just to get out the door. I'll be praying about your speaking events. I completely understand stepping out of my comfort zone. I remember how I felt the first time I facilitated a Bible Study for church. You know of a few areas where Bryan and I are stepping out of the comfortable! But we are also looking for a new church home after 7 years. This is not fun and not something we wanted to do but we are also trying to step out in obedience and do God's will...exactly what you posted about! I want to know how the speaking goes!! I got your voice mail but I had got out of the Beth Moore simulcast late. Didn't think you'd want a call back at 10:00!!! Your message was so sweet!! I saved it! I find that Sundays are the most trying days for us kid-wise as well. I've come to realize that it might be someone's way (a sneaky little devil) of discouraging me from going to church. I give in way too easily most of the time, and we haven't been to church regularly in some time, but when I can see that something is trying to prevent me from going to church it's easier to fight for what I know is good for me and for my family. Just take it one week at a time! Hi Kelly! I normally do not leave a comment, but I do enjoy following your blog! We have a 2 year old little boy. On Sunday's we learned real quick that our schedule should be and is: Church, home for lunch and a nap, play time, Sunday night Church. We NEVER try to do lunch after morning services anymore!! Instead, a group from our Sunday School class always goes to eat Sunday night after services! It's great! Also, is there a Mother's Day Out close to you? Although I am a full-time working Mom, several of my SAHM friends take advantage of this. It's just a few hours 1 or 2 days a week, but it allows the kids time to be with other kids and the Moms time to do Mom things! Just an idea! This is totally different from what a lot of people are telling you but my opinion is that Harper is only going to be a little girl once and you should just love every second of it. I know that Mom's morning out programs are wonderful and you should totally take advantage of them if that is what you want. But...if you love having her with you all the time, who is it hurting? Trust me, she is going to get bigger and want to walk two steps ahead of you someday either way. My oldest baby is 7 now and I never regret one second that I spent keeping him close to me. They grow up so quickly; I hold on to as many moments as I can. haven't checked in for quite a while...life is just so busy the older they get! Just wrote out our weekly obligations for fall and we have something (and usually 2 or 3 things) every day but Sunday...because we all know where we are on Sunday! I didn't get to read all the comments, as I have no time anymore, so this may be a repeat, but when my little one was having some seperation issues, I played lots of 'where's Mommy' games at home. I would play peek-a-boo around door jambs and such and each time I'd hide for just a few seconds longer. I also would leave the room (child was safely in playroom) to switch over the laundry and I would sing a silly song or hum a little ditty so that he could hear I was not far. Just a couple ideas that worked for me!! Your post really hit home with me. I am struggling so hard right now with going back to work. Because of a sad situation with my marriage, I HAVE to go back to work after almost 10 years of staying at home with my babies. I think God is telling me that I need to teach since that would be the best job for me to spend as much time possible with my children, but I am so nervous!! I am afraid those kids are just gonna chew me up and spit me out. I am so proud of you for facing your fears and I know you will do a fantastic job. Just pretend you are talking to your best friend! I'm an avid reader of your blog. I don't comment too much...seeing as you get a billion comments a day...but this post really spoke to me. I have been praying about this exact thing, God's will in my life, lately. My husband and I live in Cleveland and absolutely hate it. The weather is awful, my job is worse, and we're just over it. He has been trying to find a job for so long now and the market is just awful for attorneys. So I'm trying my darndest to figure out God's will for us here. My husband recently got an interview, though, at a firm in Memphis. We leave in 2 weeks! We are hoping and praying that this is the right place for us seeing as it would be perfect timing with our lease ending here in Cleveland in October. But, I continue to pray not to let his interview go well and for us to move...but for use to find God's will wherever we are. Oh some days it is just SO hidden isn't it?? I work full time and my son screams too! He cries when I leave him at the babysitter and the nursery at church. Hard on me, but I know that he is ok. It is just a phase that they go thru (some longer than others), but it will get better. Good luck on your speaking, I wish I was there to hear it, your story is amazing. I really enjoy reading your blog. It is always a blessing to read about another Christian family. Don't ever feel badly that your sweet girl is crying in the nursery. I know I used to feel bad about that too. Every baby is different. I know I used to wonder why my friends babies were so calm and still and mine was always looking around and fussy. But ultimately she is a mover and shaker! So don't feel bad! God bless you and your family! We have some friends who have a 11 month old son who FREQUENTLY screams in the nursery. They have learned to not go in there at all between Sunday School and Church, because it seems to make him worse. They "hide" around the corner after Sunday School and make sure he's ok, but don't go in there. It really works for them, because he's forgotten about them leaving him after the first hour, and is fine for the second. Harper will get better!! My first was just like that! I think some kids are just more attached. My second who is almost 11 months is completely the opposite and I can drop him off anywhere and he doesn't care! If her screaming and crying doesn't pull at your hearts strings then I'd be worried about you, LOL!! This is mommmyhood!! OH- and I will be praying for you on the speaking things! Maybe Harper is singing a joyful noise to the Lord. Maybe to those around it it screaming, but the Lord thinks it is music to his ears. I think Harper gets prettier each time I read your blog. Practical suggestion: don't check on her between services. When she sees you, she's going to expect you to get her. If you leave at that point she's just going to be more upset than she would have if you hadn't checked in on her. She just needs to learn that mom will always come back to pick her up, and she will. You just have to persevere in this area. She'll get better in the nursery eventually! Just keep trying it. I've helped out a lot in our church nursery and there's always a few babies that have a harder time than others, but after a bit you'd never know it. And it's not always the SAHM babies either. I stay at home, and for some reason...which I had nothing to do with...my son did fine in the nursery. but I'm really nervous about leaving my Harper in there in a few weeks! She's probably just really smart and knows exactly what she wants! :) If you don't need to feed her or anything like that, it is probably better not to check on her, or check on her, but don't let her see you. It's so hard though! I have been praying that your speaking arrangements went well today. I am sure that God will give you the words he wants you to say. He always has a plan for us. Little Harper is so sweet. She keeps getting cuter with every photo I see!! Have you thought about working in her classroom and there will be no separation? You and hubby could both be in there to teach/work. Just a thought from a grandmother of 14. Sheesh girl! You are better than me! After the spit up thang, I would have just stayed home! Sweet Harper loves her mommy!! Kelly, that is so funny about your speaking. I used to sing, but that was before I had a family. I stopped to be a mom. In the last year, I have struggled with not using what God had given me. I decided that I would put myself out there and obey. He has given me some opportunities, but I am scared to death about being in front of people now. I can relate to your fear and pray He will equip you with what He desires for people to hear. Just trust and obey. You go girl!! Thanks for sharing the precious pictures of Harper. She is cuter and cuter every time you show new photos of her. I WOULD STAY IN THE NURSERY WITH HER FOR A FEW SUNDAYS. YOU FIRST AND THEN YOUR HUSBAND. LET HER KNOW THAT YOU FEEL THIS IS A SAFE PLACE. THEN LEAVE HER AND COME BACK IN 15 MINUTES AND GET HER. WORK THE TIME UP TIL SHE FEELS SAFE AND CAN STAY AN HOUR. ETC. I WOULD LEAVE HER DURING THE WEEK WITH YOUR FRIENDS ALSO. JUST FOR 30 MINS OR SO AND THEN AND HOUR. SHE NEEDS TO GET USED TO THIS AND YOU ARE THE ONE TO TEACH HER. MY SECOND WOULDN'T LET ANYONE TOUCH HIM IF I WAS AROUND. I HAD TO PAY SOMEONE TO BE IN THE HOUSE SO HE HAD TO GO TO SOMEONE ELSE WHILE I WAS THERE. THIS IS LEARNING AND YOU ARE THE FIRST STEP TO TEACHING THIS. SHE KNOWS YOU FEEL BAD AND DON'T LIKE TO LEAVE HER... SHE CAN READ YOU LIKE A BOOK!!! 1. Is Harper comfortable in a baby sling? If so, can you "wear" her during church and sunday school? 2. Would it be possible to have one of the nursery workers come over to your house a time or two during the week for an hour or two so that Harper feels more comfortable staying with someone who is not a "stranger." When they visit, you can go into and out of the room and try to be scarce so that they can work on building trust. Just suggestions..I know this can be hard. Good luck with your speaking engagements.